Anytime Fitness released images of its new corporate campus as it gets ready to break ground on the Woodbury headquarters building. 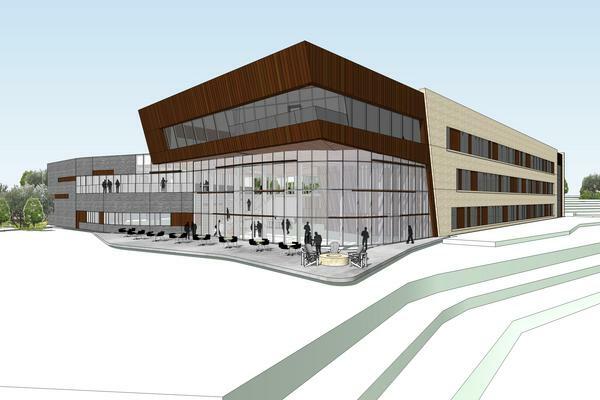 The 80,000-square-foot building will house 250 employees who are now working in the fitness club chain’s current headquarters in Hastings. The new digs include a fitness club, outdoor gathering areas that will also be used for physical activities, a smoothie bar that turns into an alcohol bar, a gaming area and adjustable workstations that allow employees to work while standing or moving, said spokesman Mark Daly. It even includes a tattoo parlor. Anytime franchise owners, employees and customers have inked on themselves with the company logo. Daly said construction on the project, on a 38-acre site at the I-94 and I-494 interchange, will start in September. Thecompany paid $1.6 million for the land. The architect is BWBR Architects Inc. of St. Paul. The contractor is D.J. Kranz & Co. of Plymouth. Coen & Partners of Minneapolis is landscape architect. Anytime Fitness is one of the fastest-growing fitness chains in the world, adding 338 stores last year. it has 2,500 gyms and 2 million members.